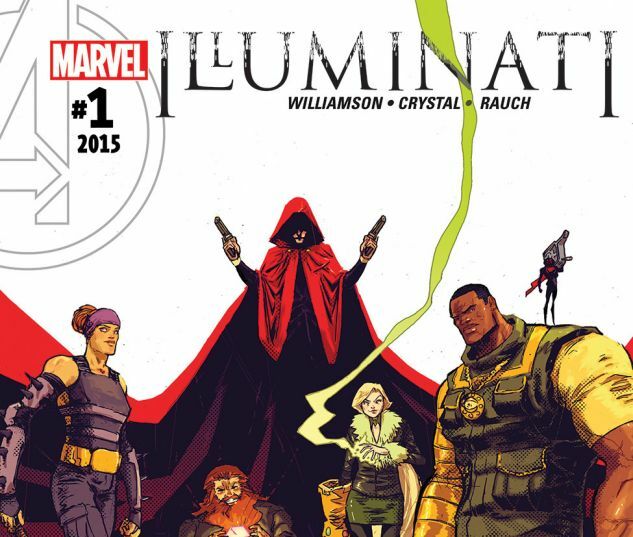 Today, the final issue in Marvel’s newest iteration of the “Illuminati” team comes out. Rather than being about a group of heroes coming together to save the Earth from enormous threats (that’s Al Ewing’s territory for The Ultimates), it features the Hood gathering together a group of villains for his own mysterious plans. The main focus of this article will be to convince you to read this series. In case you can’t get individual issues, a trade entitled Illuminati: Life Of Crime is coming out on June 29th. Right off the bat, the characters are cool. I don’t know a lot about the Hood, but the version presented in this series interests me. Secondly, we have one of my favorite Marvel villains, the Mad Thinker and the Absorbing Man. Of course, we can’t have Absorbing Man without Titania, and we also have Black Ant, Thunderball, and a new Enchantress. I love heist stories. That’s why Ant-Man is my favorite MCU movie and why Artemis Fowl is one of the greatest series that Eoin Colfer has ever produced. (Coincidentally, Eoin Colfer is writing an Iron Man prose novel for Marvel Comics and you can read a preview here.) The first general arc in Illuminati revolves around a plan to pull a heist on Asgard itself. Finally, despite being about a group of villains, Illuminati is surprisingly sentimental. Absorbing Man and Titania trying to find happiness in their marriage is a recurring element in the series. In fact, during the Avengers: Standoff! tie-in, we get a very emotional storyline. It doesn’t feel forced or editorially mandated. It feels like a natural progression of the characters. Now, I want to be honest, so here is the only negative that I can think of in the series. The seventh and final issue does feel rushed and some plot developments feel confusing. I would attribute that to it being the final issue. I suspect that if the issue was not unceremoniously cancelled, then it would have expanded on certain spoilery events.